Home Editorial	What has President Buhari done on WHO DG’s Letter? As Health Ministers convene in Geneva, Switzerland, between May 21-26 for the 71st World Health Assembly, Nigerians seek to know how the country responded to the World Health Organization (WHO) Director-General’s letter to President Muhammadu Buhari. The WHO Director-General, Dr Tedros Adhanom Ghebreyesus, had in a letter addressed to all Heads of States of member states in March, 2018, called on all countries to take three concrete steps towards Universal Health Coverage (UHC). Dr Ghebreyesus proposed that at the World Health Assembly in May 2018, as many countries as possible should be ready to make commitments about the actions they will take in the next 12 months to increase access to services and reduce out-of-pocket spending. He says the WHO was founded 70 years ago on the conviction that health is a fundamental human right, not a privilege. “Decades of lessons in global public health have taught us that bold objectives require paradigm shifts in action. Realizing the ethos of the Sustainable Development Goals to ensure that no one is left behind, in resonance with WHO’s mission to promote health, keep the world safe and serve the vulnerable, warrants such a landmark global movement towards UHC. I ask you to join me in catalyzing this global movement. The prize is a safer and fairer world for all people, and better health for all,” the WHO DG says. However, the Federal Government has said that it is targeting the inclusion of one per cent Consolidated Revenue Fund (CRF) in the 2018 budget for basic healthcare provision fund. 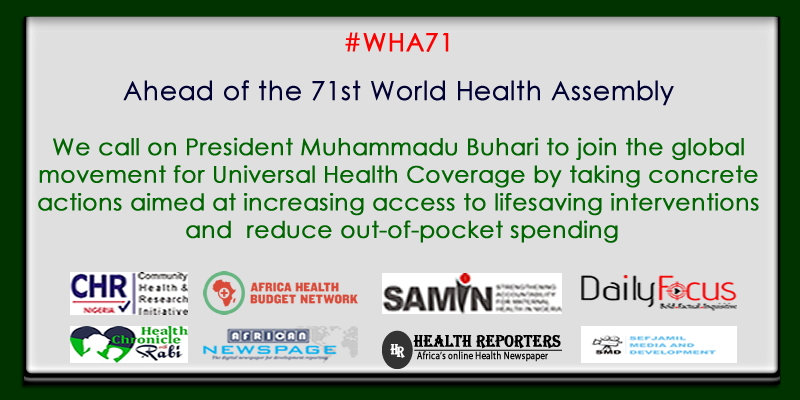 Nigeria’s Minister of State for Health, Dr Osagie Ehanire, who disclosed this also said government has recognized the importance of Universal Health Coverage, in the National Health System, as part of its social protection architecture for the nation. The National Health Act sets aside 1% of Consolidated Revenue Fund as Basic Healthcare Provision Fund, of which 50 per cent enters the National Health Insurance Scheme (NHIS) gateway and 45 per cent the National Primary Health Care Development Agency (NPHCDA) gateway, leaving 5 per cent as Emergency Fund to utilize via the health ministry’s gateway. “We desire a more purposeful cooperation and collaboration between the health ministry, Legislative Network for Universal Health Coverage, other civil society advocates and all the National Assembly Committees to ensure the inclusion of the 1% Consolidated Revenue Fund in the 2018 budget,” the Minister said. Also, the National Assembly has passed the 2018 budget presented by President Muhammadu Buhari to a joint session since November 2017. The budget was jacked up with over N500 billion. Even though it falls short of the Abuja Declaration, it is expected that when signed into law by President Buhari, it will go in long way to ameliorate most of the challenges in the health sector. We, therefore, call on the president to accelerate the signing of the budget into law, to avoid further delay, which is affecting smooth running of the nation’s health and economic sectors.